In this lab we will start to work with C#. 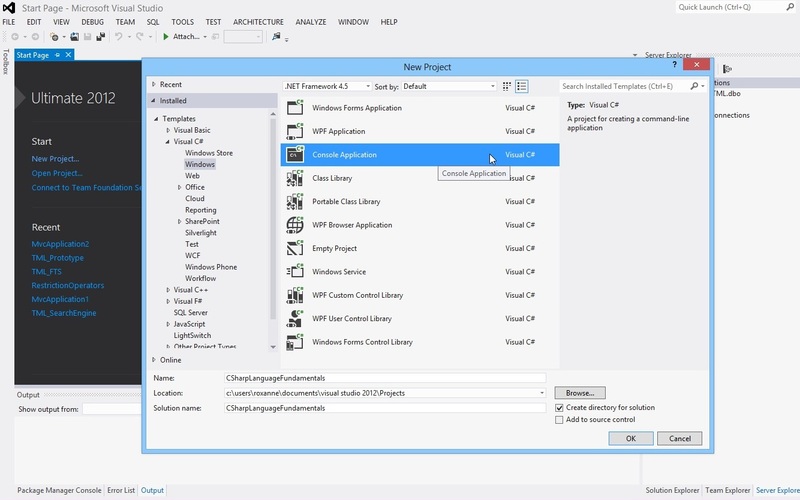 We will do this by creating Console Applications in Visual Studio 2012. Then write statements that prompt and greet the user. Select the File menu, then select New Project OR (CTRL+Shift+N). to create the directory for your solution (keeping the tick box, “Create Directory For Solution”, selected ) or leave the default location. Write another statement that reads the user’s input from the keyboard and assigns it to the ‘myName’ string. Add one more statement that prints “Hello myName” to the screen (where myName is the name the user has typed). Test the application and save your work; You can run the application by clicking on the Start button with the green arrow. Create Console Applications that uses conditional and branching statements. Complete three simple programming tasks in C#. For each solution create a new Console Application. Tip:It’s a good practice to add comments to your code. As you notice, in the code below we added some comments that makes the code more readable. In order to add a 1 line comment write ‘//’ before your comment; anything after ‘//’ is ignored by the compiler. Write statements to input two positive integers and display the sum. //The user has entered a non-integer number. Write statements to input three numbers and display the largest using if statements. Aim to use the minimum number of statements. 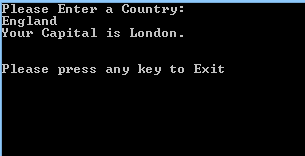 Write a switch statement to input a country and display its capital. parameter 2: states a condition. The block inside the for loop is executed only if the condition is true. The condition should be dependant on the variable i: e.g. i < 101. The for loop block in the following code will be executed 100 times. Write statements that display the sequence 10, 20, 30, 40 … 100. Use a for loop. 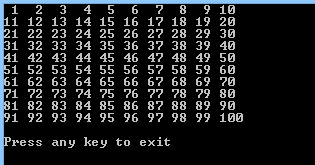 Write statements that to display the sequence 1, 2, 3, … 100, as 10 rows of 10 numbers. Use a for loop. Create a Console Application that uses arithmetic and logical operators. Complete an arithmetic and a logical programming task. Write statements using the multiplication operator to display the twelve-times table. Enter a number from 1 to 12, then display the number multiplied by 12. //Note: “const” specifies that the value of the field or the local variable cannot be modified. //its second operand if necessary. //The number is NOT between 1 and 12. Write statements to input two numbers and use logical operators to output if the result of multiplying them will be positive or negative. For example, a negative number multiplied by a negative number, gives a positive result. Examine and debug your C# code by using Visual Studio’s debugging features. These in include pausing code at a breakpoint, stepping through statements and using the debug windows. Create a Structure to hold colour values. Use the Structure in code. Define a struct called Colour, with a constructor and a ToString() method. // The colors are not set and will have the default value. Create an Interface and a Class to hold client details. Instantiate an object from the class in code. // Note: An interface contains only the signatures of methods, delegates or events. “Implementing the Order Method for IClient. Create a Console Application that uses a two dimensional array to hold data. 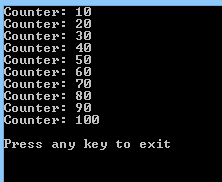 Populate the array with integers using a loop. Create a two dimensional array of integers. Use looping statements to populate the array. Populate an ArrayList, Stack and Queue collections. Then display the values. Create an ArrayList of integers. Use looping statements to populate this with multiples of 10. Print each member of the list. 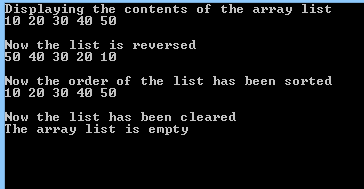 Experiment with the ArrayLists methods, including the Sort(), Reverse() and Clear() methods. Create a Queue of integers. Use looping statements to populate this. Experiment with the Queues methods, including the Dequeue(), Enqueue () and Peek() methods. //The method Peek get the first element. Create a Stack of integers. Use looping statements to populate this. Experiment with the Stacks methods, including the Pop(), Push () and Peek() methods. Create a Console Application with strings to hold textual data. Then extract a substring from a string. Also split a string into parts. Finally loop through an array of strings. Initialize a string with value = e.g. http://www.bbc.co.uk . Experimenting with extracting substrings, e.g. “bbc”. Add exception handling to an application. When an exception (error) occurs the code branches to an exception handler. The handler can then take action to resolve the problem. 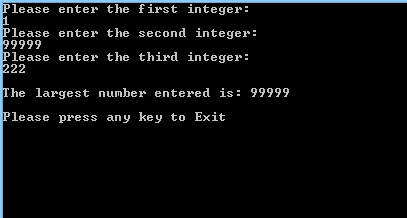 Create a console application to enter two integers, then divide the numbers. A delegate is a pointer to a method. After declaring a delegate, it can hold any method, providing the number and type of parameters match the delegate’s declaration. Create a class Pair and include a delegate called WhichisFirst, a constructor, and methods called Sort() and ReverseSort(). // two objects by whatever criteria the objects like! The sort methods will take as a parameters an instance of the WhichisFirst delegate. Test the Pair class by creating a Dog class. This implements methods that can be encapsulated by the delegate. return d1.weight > d2.weight ? Generics allow the type of a parameter to be changed at runtime. This allows the creation of very generalised classes and methods, that can work with any type of data. There are lots of useful predefined generic collections in the .Net framework. Create a class that is generic. Add generic methods to the class.